Specifically designed for .17 to .50 caliber rifles and pistols, .410 to 12/10 gauge shotguns and all in-line muzzleloaders. 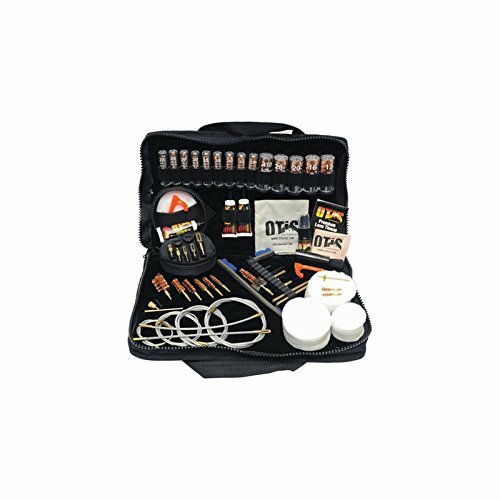 Over 40 firearm-specific cleaning components in a nylon case. Six (6) Memory-Flex Cables of varying length for effective and correct Breech-to-Muzzle cleaning. Twenty-two (22) bronze bore brushes remove copper deposits and other fouling. Obstruction removal tools for jammed cases and other blockages. Specialized precision tools for complete breakdown and fine cleaning of all critical and hard to reach areas of your firearm. Optics cleaning gear for care and maintenance of scopes, rangefinders and more. Removable Tactical Cleaning System (Item # FG-750) for convenient carrying in the field. Dimensions: 15 1/4 x 8 3/4 x 4 1/2 inches.